Google Developers Blog: Hello to orkut Developers! in the last update to the former orkut Developer Blog last week, henceforth we’ll be posting all orkut developer updates to this blog. We think this is also a good opportunity to quickly introduce the newly-launched Developer page to you. 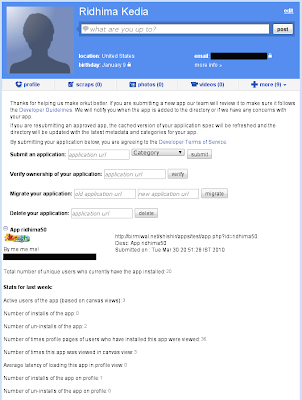 We recently added this feature to the orkut sandbox which we hope to be a one-stop solution for developers looking to manage their applications from a single page and view their stats. 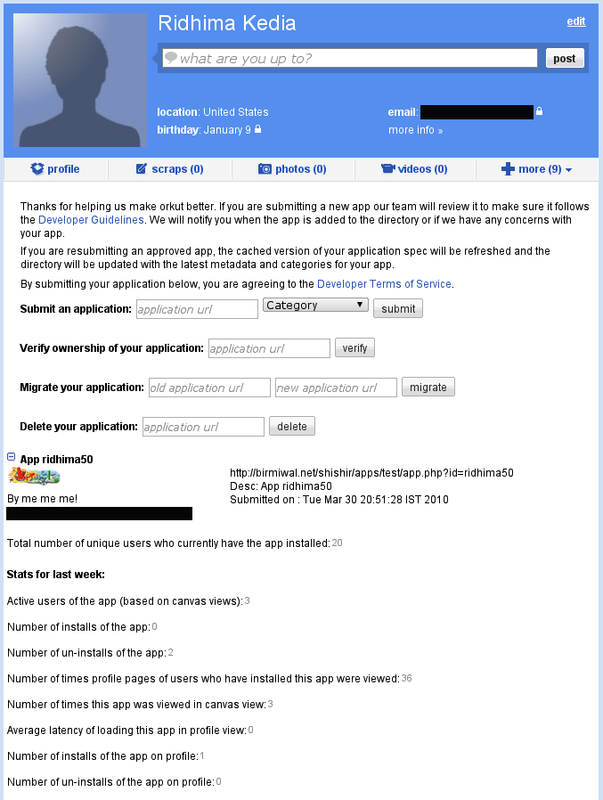 You can submit your apps directly from here and verify them to complete the submission process. You can also maintain your apps from here and migrate them to a new URL, or delete them entirely from the directory. And if you have applications that have already been approved and included in the directory, expand their details to track the number of installs, uninstalls, renders and other useful stats updated every week. Please note that the Developer page requires you to be on the new orkut UI to work. So keep your apps coming and point your browser to the one page to manage them all: sandbox.orkut.com/Main#Developer. And stay tuned for all orkut updates right here on the Google Code Blog! As we announced in the last update to the former orkut Developer Blog last week, henceforth we’ll be posting all orkut developer updates to this blog. Developers need an API for Orkut! I just realized that clicking the sandbox link takes me to my Orkut page. Is this by design? @abhijit: Yes, probably because you don't yet have a sandbox account. That's easy, signup for the sandbox here: http://sandbox.orkut.com/SandboxSignup.aspx. For more details, check out: http://code.google.com/apis/orkut/.